Our event in the 2011 Auckland Heritage Festival was ‘A Toast to Heritage’ on Sunday 18 September. Allan Matson, our president, presented a 45-minute talk on the general history of pubs in central Auckland, illustrated with a selection of historical photos. He discussed the evolution of pub architecture, some of the sad losses and recent development casualties. He also profiled heritage buildings which have been adapted for reuse as pubs. 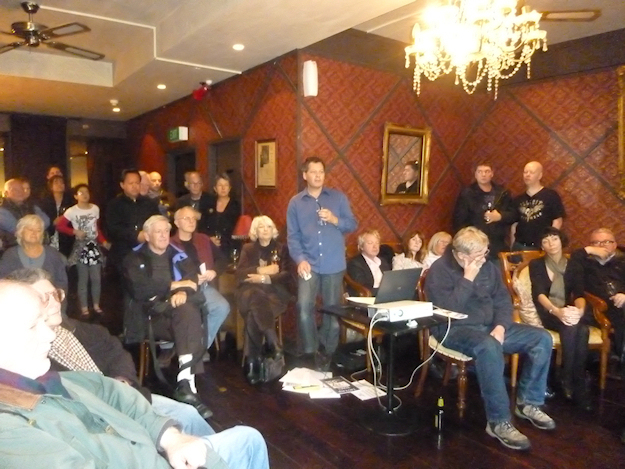 The presentation, appropriately held in the Queen’s Ferry Hotel, Vulcan Lane, was well attended and enthusiastically received. A brochure for the self-guided pub crawl was available and can be viewed here. Further information about central Auckland pubs can be read in this PDF document.